Well, it's not the knitting that's stressed out, it's me. Things are falling apart at work, and so am I. So I cope by knitting easy projects that don't take a lot of brain power. First up is a bib for my nephew. He'll be eating solid foods within the next couple of months and will needs lots of bibs. The pattern is from "Mason-Dixon Knitting." I'm using Peaches 'n' Cream yarn from Elmore-Pisgah, which sells a Mason-Dixon pack of 12 balls of coordinating yarn. 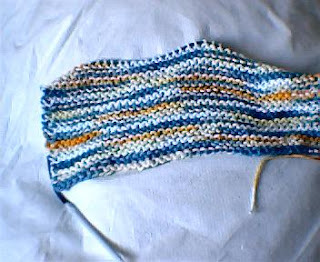 I'm alternating stripes of Shaded Denim and Daisy Ombre for this bib. I'll probably do another one in green. Second, I'm finishing a pair of socks for my sister. 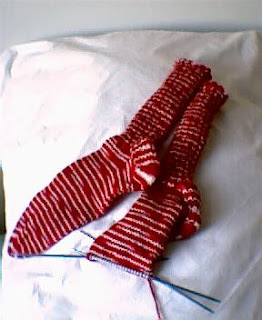 She really liked her Christmas socks, so I'm doing another pair for her birthday. Finally, one of my co-workers has been extremely supportive during this difficult time, and I want to make her something special before I leave. 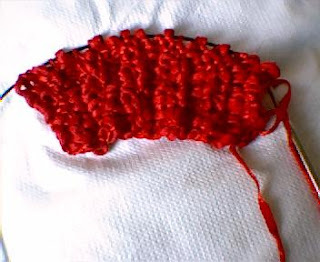 I'm making a narrow scarf using the mistake stitch rib pattern and Tai yarn from Filatura di Crosa. It's a cotton blend ribbon yarn. I think the color will look great with her complexion. I hope the new year is going better for the rest of you than it is for me. I'm trying to remind myself of what Elizabeth Zimmerman wrote: "Knit on, with confidence and hope, through all crises."